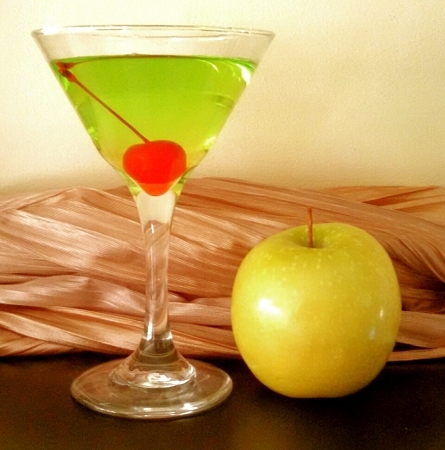 Appletini is a newer cocktail drink mix that was released this past summer due to a request from several customers. 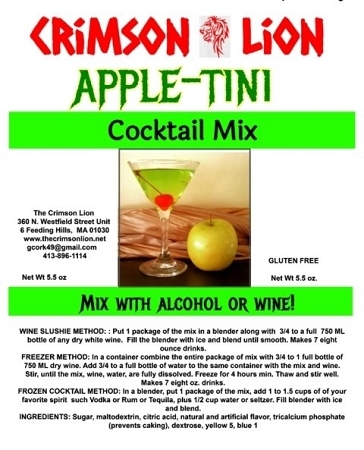 Our Appletini mix yields 8 (4) oz. glasses. Fill Martini Glasses with ice to chill. In a pitcher combine mix with 2 cups water, 1.5-2 cups Vodka ( use 2 cups of Vodka if no Apple Pucker or Schnapps), 1/2 cup of Apple Pucker or Apple Schnapps. Some use apple juice instead. Add ice and stir briskly. Add a cherry. makes 8 (4) oz glasses. Option: Use white wine instead of Vodka as its a great taste as well. In a blender 1 package of the powder mix, 3/4 bottle of dry white wine (750ML bottle), and fill remainder with ice. Blend and serve.